As the title suggests, the object of this game is simply to slice fruit. There is no sorrowful back story or a princess to rescue; just make some fruit salad and avoid slicing the bombs. There are three game modes: classic, zen, and arcade. Zen mode is the easiest since you have no lives to lose or bombs to worry about. Your goal in zen mode is to slice as much fruit as you can in ninety seconds. If you slice multiple pieces at a time you will get a combo bonus. 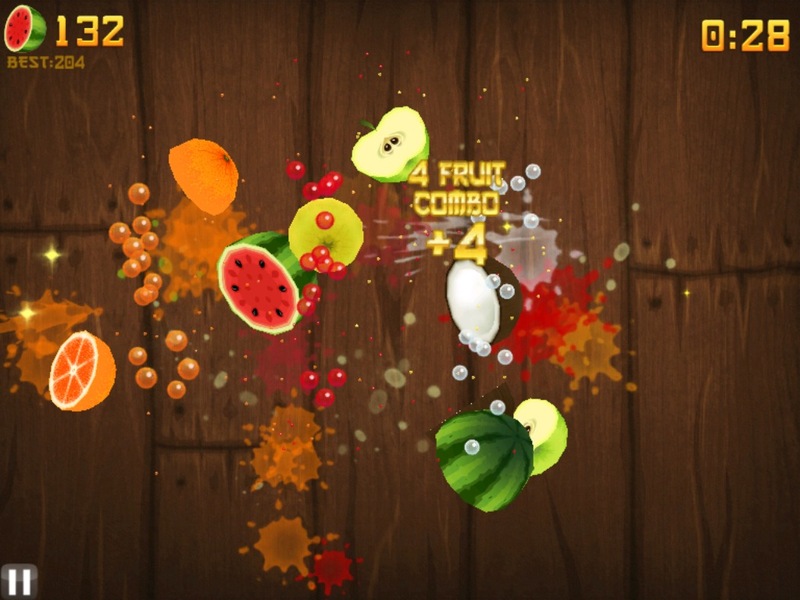 If you slice and dice multiple kinds of fruit at once you will earn a fruit salad bonus. Classic mode lets you play until you accidently slice a bomb or you miss slicing three pieces of fruit. The Arcade mode does have bombs but they don’t end your game if you slice them. In this mode you have sixty seconds to slice fruit and if you slice a bomb you lose ten points. There are various color bananas that will double the points or bring on a fruit frenzy if you slice them. Various bonuses can be earned; I have gotten a bonus for avoiding all the bombs and another for hitting them all. Strengths: Fun game play; great use of the touch screen. Weaknesses: No multiplayer but you can compare scores. Moral Warnings: Merciless slicing of fruit. If you like unlockables and achievement this game will not let you down. You can unlock new swords and backgrounds by meeting certain criteria. Some new swords require you slice a set amount of a particular fruit or end your game with a certain score. While there is no direct multiplayer support you can setup the feint system to add friends and compare your scores with them or the whole world. The background music is oriental themed and is very fitting for this game since you’re playing as a samurai. The fruit slicing sounds are spot on and make the fruit you’re slicing seem juicy. You can disable the music and/or sound effects if you desire. The graphics are colorful and the interface is easy to navigate. There is plenty of fruit variety including strawberries, watermelons, coconuts, pears, apples, banana, oranges, lemons, limes, kiwis, mangos, pineapples, and more. The wood backdrop is changeable as you can unlock new patterns for it. This cute little game is fun for all ages, and for .99 cents you can't go wrong. With the random fruit facts in the menu, you might even learn something! Did you know that eating plums increases the absorption of iron into the body?